‘America’s pastor’ shaped modern evangelicalism. During his life, Graham preached in person to more than 100 million people and to millions more via television, satellite, and film. Nearly 3 million have responded to his invitation to “accept Jesus into your heart” at the end of his sermons. He proclaimed the gospel to more persons than any other preacher in history. In the process, Graham became “America’s Pastor,” participating in presidential inaugurations and speaking during national crises such as the memorial services following the Oklahoma City bombing and the 9/11 attacks. “He became the friend and confidante of popes and presidents, queens and dictators, and yet, even in his 80s, he possesses the boyish charm and unprepossessing demeanor to communicate with the masses,” said Columbia University historian Randall Balmer. Graham appeared regularly on the lists of “most admired” people. Between 1950 and 1990 Graham won a spot on the Gallup Organization’s “Most Admired” list more often than any other American. Ladies Home Journal once ranked him second only to God in the category of “achievements in religion.” He received both the Presidential Medal of Freedom (1983) and the Congressional Gold Medal (1996). Graham was a model of integrity. Despite scandals and missteps that toppled other leaders and ministers, including Graham’s friend Richard Nixon and a succession of televangelists, in six decades of ministry, no one ever leveled a serious accusation of misconduct against him. That’s not to say he wasn’t seriously criticized. Some liberals and intellectuals called his message “simplistic.” Some fundamentalists considered him “compromised” for cooperating with mainline groups and the National Council of Churches. His moderate anti-segregationist stance during the Civil Rights era drew fire from both sides: white segregationists were furious when he invited the “agitator” Martin Luther King Jr. to pray at the 1957 New York City crusade; civil rights activists accused him of cowardice for not joining them on protest marches and getting arrested for the cause. Perhaps Graham’s lasting legacy was his ability to present the gospel in the idiom of the culture. He did this brilliantly, making innovative use of emerging technologies—radio, television, magazines, books, a newspaper column, motion pictures, satellite broadcasts, Internet—to spread his message. In the 1990s he reengineered the formula for his “crusades” (later called “missions” out of deference to Muslims and others offended by the connotation). 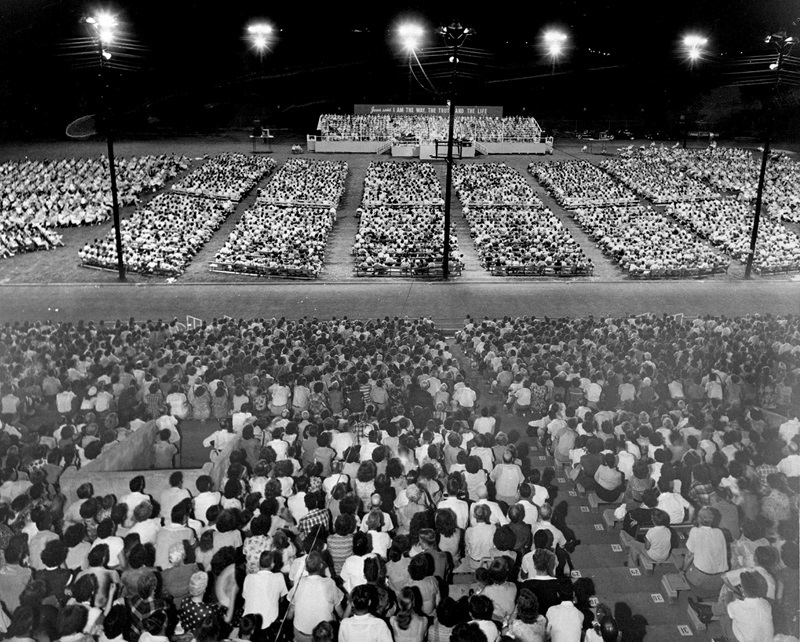 His standard “youth night” was revolutionized into a “Concert for the Next Generation,” with Christian rock, rap, and hip-hop artists headlining the event, followed by Graham preaching. This format drew record numbers of young people who cheered the bands and then, amazingly, listened carefully to the octogenarian evangelist. For many, however, William Franklin Graham won’t be remembered for these accomplishments. He’ll always be “Billy,” as he preferred to be called. He titled his autobiography Just As I Am, a reflection of his humble spirit, taken from the hymn sung most often when he invited people to come forward and receive God’s love.